The Leaf uses a front-mounted electric motor driving the wheels, powered by a 24kW·h/90 kW lithium ion battery pack. The expected cruising range is the same as the EV-11 prototype, as is the engine. The battery pack is made of air-cooled stacked modules. Although an exact price has not been announced, the car is expected to cost somewhere between $25,000 and $33,000. The car has a top speed of over 87 mph. The battery can be charged with 440 Volt, 220 Volt and 110 Volt sources. With 440 Volts, it can be charged to 80% capacity in about 30 minutes with a special quick charger that sends 440/480 volt direct current to the battery. With 220 Volt, it can be charged in 4 hours, and in North America and Japan using standard household 110 Volt outlets it can be charged in 8 hours. 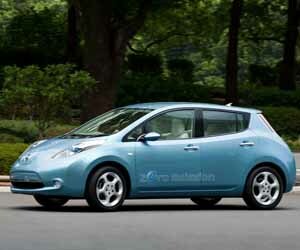 Nissan Leaf will employ an advanced IT system. Connected to a global data center, the system provides support, information, and entertainment for drivers 24 hours a day. The dash-mounted monitor displays the Leaf's remaining power, in addition to showing a selection of nearby charging stations. User’s mobile phones can be used to turn on air-conditioning, the heater and re-set charging functions even when the vehicle is powered down. An on-board remote-controlled timer can also be pre-programmed to recharge batteries. 100 mi (160 km) on the US LA-4 driving cycle .